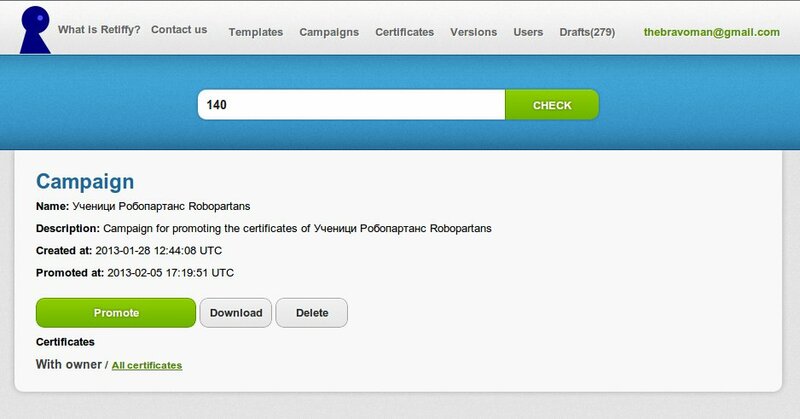 Sometimes after we have created many certificates we want to download them. We want for example to print them. Till now it was possible to download each certificate separately, but this is a very tedious process especially if you have hundreds or even thousands of certificates in a campaign. That is why you can now download certificates from a Campaign in a PDF or CSV file. PDF is suitable for viewing and printing while CSV is suitable to editing and then mass updating certificates. Finally you would receive an email with link for downloading the certificates. This link is available for about a day.